I have received a couple emails asking for the basics of my notebook before I do more content posts. So... here ya go! Then flip the page and we start our table of contents. 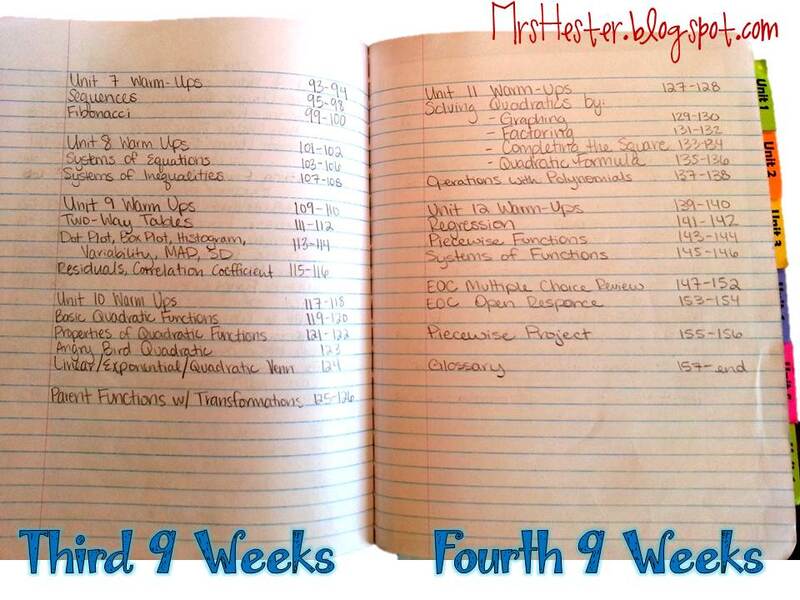 This year we used four pages, one for each 9-weeks. It worked pretty well! 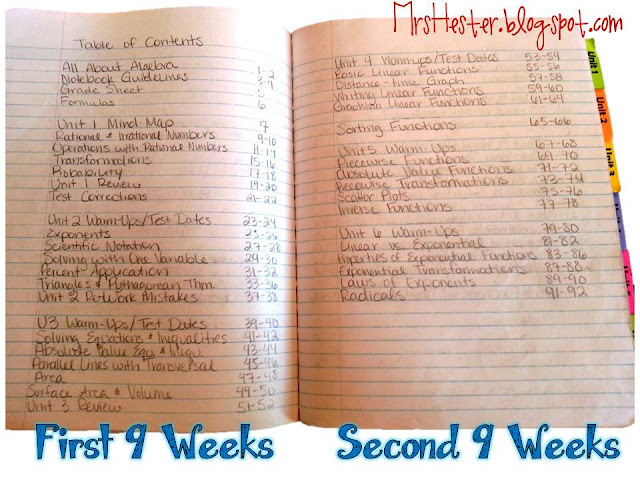 After our Table of Contents is our "All About Algebra" pages. These can be seen here. 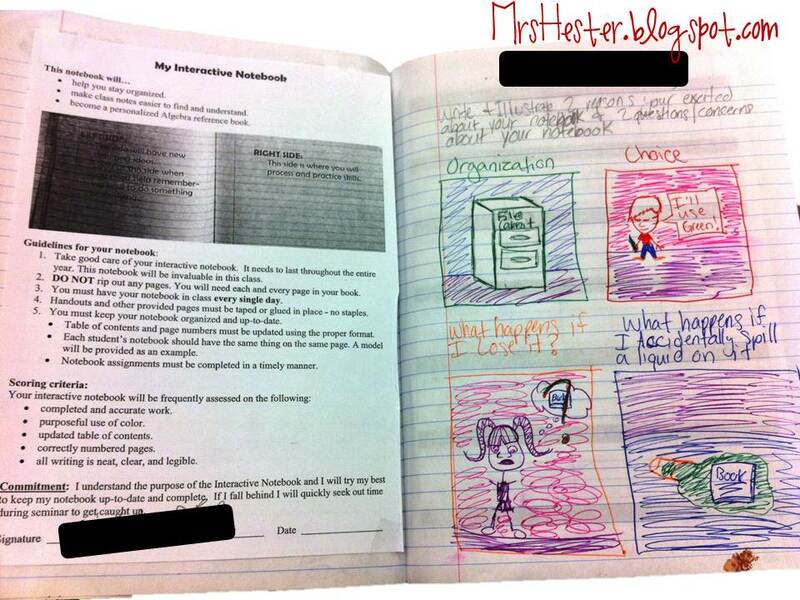 After those pages its our Interactive Notebook Guidelines. All students taped in the notebook guidelines on page 3 and then completed homework on page 4. Their homework was to illustrate two reasons they're excited to use their notebook this year and two questions/concerns they have about the notebook. We spent a few minutes at the beginning of the next class period sharing excitements and also addressing and answering some of their questions. They were pretty pumped about this assignment! **Note: we left these pages blank for about a week and a half and did most of Unit 1 content. I wanted to give students time to work with the notebook so they could have real ideas about excitements and questions. Doing this assignment on day 2 would not have been as productive in my opinion. After our guidelines is our grade sheet and reference sheet. 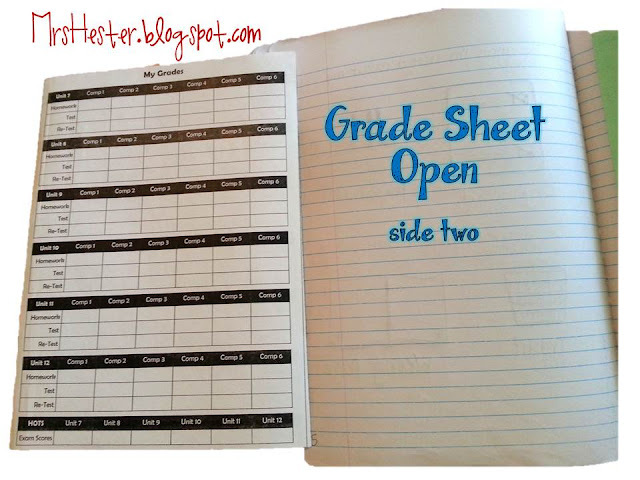 The grade sheet on page 5 is relatively simple but a great resource for students. Almost every homework assignment and exam grade is recorded on their grade sheet. Also, my district implements Mastery Math so my students have a retest opportunity for most tests and must qualify to take that retest. This grade sheet helps students stay organized, record their test grades, manage their qualifiers (usually homework), and record their retest grades. We also use it periodically to calculate class grades. I like giving students practice calculating their own grades so they know exactly how it all works. 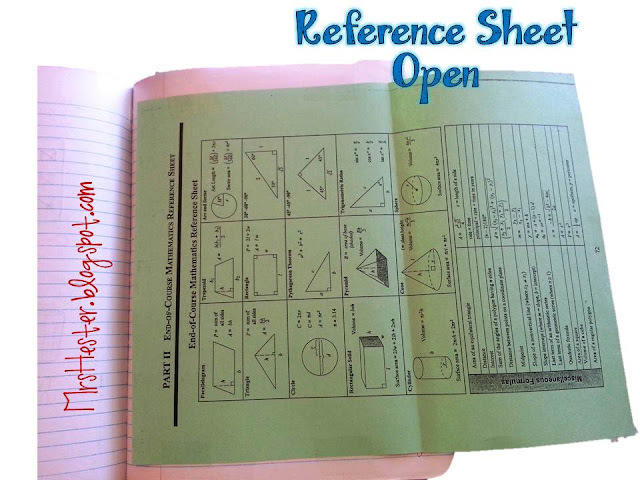 The Reference Sheet is folded to fit onto page 6. 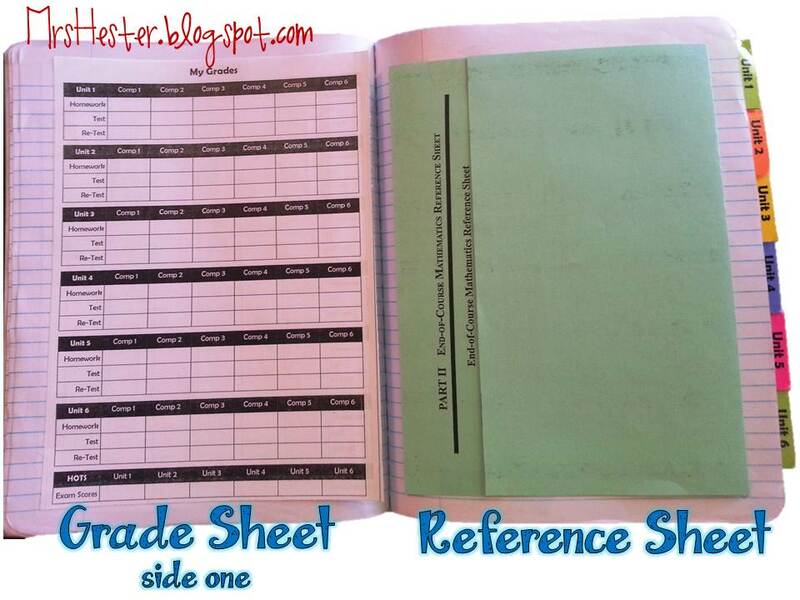 It is the same reference sheet that students are given for their EOC exam so we practice we it all year. I like students to have their own copies so they can reference it during any assignment as needed. Alright... after that we start content pages! You can see the content covered in my table of contents pictures above, so let me know any requests of topics you want to see! After all the content pages is our glossary. You can see a few pictures of those here as #2. This is fantastic, thank you for sharing what you do. I found your blog via Pinterest. I'm a new follower. Bethany, welcome!! Thanks for your kind words! Would love if our exlpained giw you manage the pretesting and having student prove they have practiced to retake. 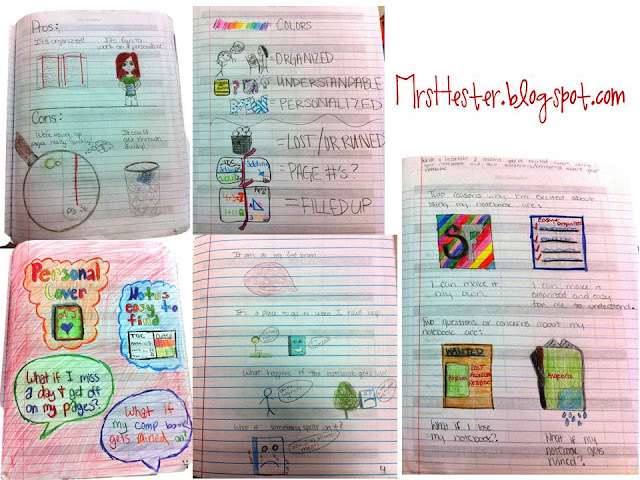 I am trying the interactive notebook in my science classroom this upcoming school year. I love your blogs. I would love to know more about the retesting and how they qualify as well. Celtic Clan Momma and Bridget, I'll do a post on that soon. Stay tuned!! Jennifer, so glad you stopped by and enjoyed it! More on the way soon! Do you have a pdf of the reference sheet that could be downloaded? Hi Jessie! Thank you for this post, I had numerous questions on interactive notebooks and this cleared up most of them! I few more questions though: do you provide the notebooks or are the students required to purchase them? What about the rest of the supplies (tape, colored pencils,...) ?